The Owen Agency has worked with clients including Virgin Media, SSE, Channel 4's Place in The Sun and many marine clients. Our creative and powerful 'responsive' CMS websites are 'best in class'. Well before we start the process of pulling together the technical specifications of your website we need to do some desk-top research and see just who else is in your 'space' so we can position your website so it stands out from your peers. Building your market place differential starts here. We then look at your customer profile and develop how we can maximise the visitor experience and enhance the customer journey along all the touch-points that combine to obtain the contact outcome you need. We have specialists in house in research, customer profiling and visitor journey to advise you on these important considerations. From a mechanical point of view websites need to be fully 'responsive' eg. they automatically size to fit tablets, smartphones and laptops. With data capture, tracking, visitor forensics and webmail processing plus communicating with your CRM, our digital team can integrate all the digital channels in a cost effective package. Over 23 years ago we could clearly see that the future was digital and started to build the team and software tools to be able to deliver a range of digital solutions, websites being a key requirement. Owens are a fully digital marketing enterprise with extensive experience. We have a talented team which is growing constantly and keeping on the curve with new digital offerings and solutions. 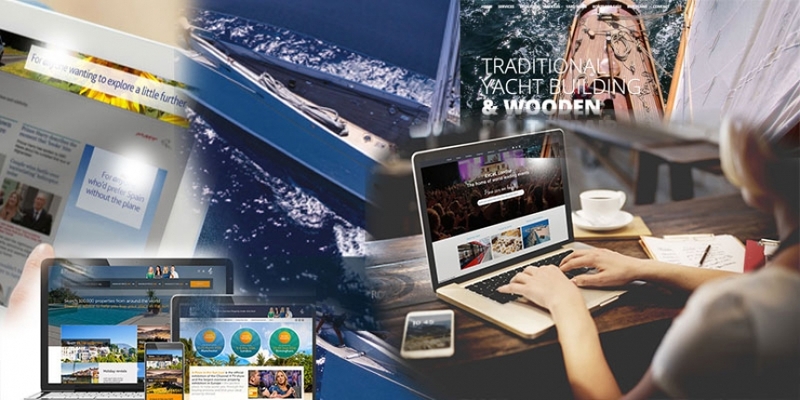 With the in-depth knowledge of the marine marketplace, especially in the superyacht sector, specialist input including marine photography and video from in-house resources, added to the long experience in website design and production, give our clients a truly unique marketing support mechanism. 2016 was a big year for Owens. After 36 years we decided to sell our Havant manor house, which had been our office from well before anyone had thought about the internet to the on-line society we are today. The move was a strategic decision, freeing up locked capital and allowing us to give the Owen Enterprise the investment in sophisticated hardware and software a fast growing Digital Agency needs in this age. The sale of Hall Place allowed us to invest in a new division specialising in the Pharma marketplace (Owen Health) and recruit new specialist talent who will redefine the marketing process in this industry. For our marine clients this fresh insight will create a new play-list to address the multi-channel challenges that face the marine industry. We found our new home near Chichester, a peaceful rural setting to spark the creative processes and named it Longcroft Barn in honour of the family who owned our old office building, Hall Place, for over 200 years before we became the second owners.